I recently had a scare. One of the terrifying moments of being a mum was receiving a message that said "Loic had an accident, go home now!" And I saw the message after a secretary of a CEO of a company interrupted a meeting the CEO was having with me to tell me that my office was trying to reach me urgently. I pulled out my cell phone to see 17 missed calls and numerous messages with one prominently displaying "Loic had an accident..."! That just set my heart racing. I immediately excused myself and called my husband while waiting for the lift. I was almost hysterical! Luckily, E was home before me and was trying to calm me down. By the time I received the news , it was 45mins after the accident and E had reached home and everything was under control. The boy was climbing up to sit on the sofa, lost his balance, fell backwards and hit his head hard on our glass coffee table. The glass was very thick and jot sharp but the impact was so great that it cut open his head! My helper tried to call me but didn't manage to get me (on hindsight, it was a good thing that she reached my husband first because he is a much calmer person). In any case, the cut was not life threatening so they waited for me to reach home and we went off to the hospital. I decided on the one closest to home as it was peak hour by then and I did not want to spend ages waiting at KK children's hospital which is the best for little ones. I reckon now that I could have done better going to KKH. At the hospital we went to, Loic was seen by the doctor, an X-ray was taken and then the doctor proceeded to glue up the wound. However, the doctor and staff seemed so inexperienced in dealing with young children that we noticed their incompetences. Firstly, there was no proper pillow for the little boy so when they had to hold his head down , they pressed him down so much that when he finally had some leeway, he cried out that he could not breath! Poor boy. Secondly, the doctor while shaving some hair from the wound area, apparently dropped some hair into the wound and then tried to pick it out of the wound with a plastic tweezers which did not hold well! The poor little one was screaming in pain when the doctor tried to tweezer the hair from the open wound! All these with no pain relief medication or local anesthesia! Finally all was over and the boy's wound was glued close. 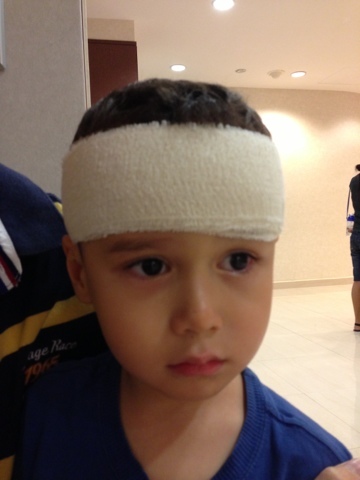 Here's my poor boy right after the ordeal. Look at that sad face. It broke my heart. This was him after when papa distracted him with some food. 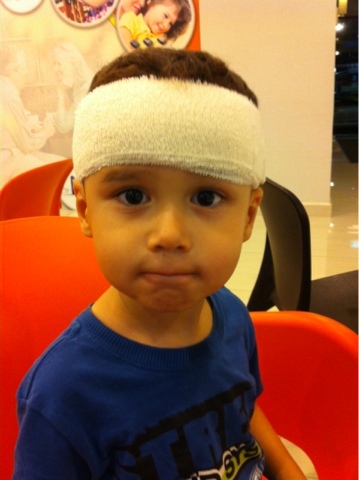 :) This boy is really a trooper.